We spent one night in a Tanzanian banda, and it was a night neither of us will ever forget. (No this isn’t the start to a sensual adult-rated story). We returned from our game drive with Tatanka Safari and Tours, and arrived at site around 4pm. The site was located along the “Elephant River”, appropriately named for the elephants and hippos frequenting the waterhole. We passed the next few hours sitting by the river and taking in everything around us. Enjoying a little snack by the watering hole. We walked over to our small banda, a round tin hut with two barred windows. We opened the sheet metal door and set our packs down on the two single beds in the center of the room. The décor was simple: one stool and two pieces of African themed fabric hanging by strings to cover the windows. Both the interior and exterior were a seafoam green. The roof was thatched. We went back inside and feeling the pangs of hunger again, we snacked on avocado sandwiches and baked beans out of a can. I took a nib of banana and peanut butter from our lunch pack, and reaching out through the bars in the window, I smeared it around the window frame. I was determined to see some animals, even if had to stay up all night. The inside of our Tanzanian Banda. By 9 pm it was pitch black. Our guide had put out the bonfire, there were no lights from other bandas and no flashlights from people walking around. Just a pure black void. We piled our bags onto one single bed and crawled into the other (we are cuddlers). The mosquito net must have been a few sizes too small because it fit snugly over our heads like pantyhose, not doing very much against the mosquitos landing on our faces. We lied there in the tiny bed, closing our eyes while listening to the sounds of wild animals around us. We imagined what kind of animals were pacing outside of our banda. What were those eyes that we saw watching us brush our teeth? Which wild beast was going to come up to our window and eat the peanut butter covered banana? We fell asleep after about an hour. 5 minutes later, Scott jolts out of bed and throws open the door again. This repeats about two more times. The fourth time, he runs to the doorway and tells me “no matter what, close this door and lock it. Don’t open it until I come back.” Standing in the doorway, I watch him run into the darkness in search of the bathrooms. I don’t know what is wrong with him. Is it food poisoning? Is it a fever? What if he is hallucinating? What if he needs something? All I know is that he is sweaty, sick, and has a terrible sense of direction. Filled with an immediate concern for his safety and ability to even find the bathroom, I run out into the darkness after him. It is a good 100 ft. or so to the bathrooms, but I just run as quietly and quickly as I can hoping that will help me to avoid detection from whatever might be out there. Scott comes out, upset that I followed him. I guess when you are deathly sick, sometimes you don’t want the love of your life right there witnessing everything happen. Realizing there is now 100 ft. of darkness and wild animal noises separating us from our tin banda, we decided to barricade ourselves in the nearby dining area. The dining room was essentially a wooden gazebo with 360 degrees of mosquito netting in place of windows. It wasn’t much of a shelter from the cold elements and the wildlife lurking outside. We pulled out the plastic dining chairs and just sat in darkness, listening to faint roars in the background and watching the silhouette of jackals pace the entrance of the gazebo. I pulled the dining room tablecloth over Scott’s shoulders, who was now shivering and holding back the need to throw up all of the baked beans from dinner. We continued to sit in silence mentally kicking ourselves for the situation we were now in. Why didn’t we bring a phone to call the armed guard? Why did we leave the banda wearing nothing but shorts and tank tops when it is freezing outside? Why did we think eating cold beans out of a can would be ok on our stomachs? We stared into the darkness around us, counting down the hours until sunrise. The silence was disturbed by a loud sound, something like Velcro being pulled apart, then followed by a slow but powerful chomp… chomp… chomp. Looking toward the river about 15 feet in front of us, we saw the solid black shadow of a hippo slowly walking past us, pulling up grass by the roots and chomping it with its massive jaws. Our initial panic turned to peace, as we watched it slowly make its way across the clearing, relaxed and fearful of nothing. We sat there in the freezing cold gazebo, all alone and in complete awe of this moment. I guess after everything, we did meet our goal. 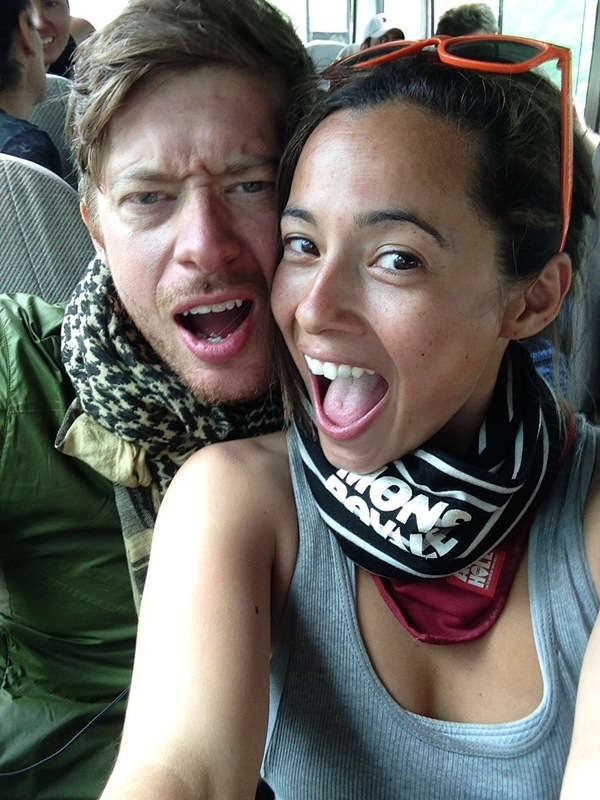 We stayed awake all night outside of our Tanzanian banda, saw some animals, and had one heck of an adventure. When planning for an overnight safari, one option is to book accommodation at a luxury lodge. There will be all-inclusive cocktails, a freshwater pool, air conditioning, and most of all, a big sturdy gate separating you from the hungry animals on the hunt at night. Another option is to go with the banda, a small single-room hut in the middle of nowhere. There are no fancy embellishments, no security gate, and absolutely no separation from you and the wild. It is just you and the animals alone in the great desert. We obviously chose the latter option and had an experience we will never forget. Despite the disagreeable stomach issues, our one night in a Tanzanian banda (or rather 100 ft outside of it) was the highlight of our trip to Tanzania. We would go back in an instant. Well that was an adventure and a half. A tad too scary! What an experience in Tanzania. Thanks for sharing your story. Haha it is one of our most memorable travel experiences to date. No doubt about it! Haha it was an adventure for sure. Despite the scary moments, hearing the animals pace outside our banda and seeing the silhouette of the rhino at night was just so surreal. We have no regrets and would do it again in a heart beat! So glad you enjoyed it. We are so glad we went with the banda option. It was simple yet exposed and authentic and raw and just everything else you could imagine. We highly recommend it! Lol Cecilia what a story!! I’ve been to Tanzania, but honestly didn’t stay in a banda! It wasn’t super luxury lodge, but I definitely could use the bathroom at any time! I’m glad you and Scott survived your stay, it’s definitely memorable! When I saw this post was a bout Tanzania I was so excited cause this is a place I’ve always wanted to go to. What a lovely sunset, the sun looks so gigantic. The mosquito net looks so quirky, I’ve never seen it on photos or in reality before! Haha that mosquito net was so small and Scott was too tall for the bed so the net ended up hugging his face like pantyhose. It was too funny! Oh my goodness, this is a memory that will last you a lifetime! How unfortunate that your husband fell ill, but he was so sweet to try to protect you from the chair in his feeble state — ha! I definitely want to stay in a banda while I’m on a safari. There’s nothing more interesting and awe-inspiring than the sounds of nature lulling you to sleep. How cool that you saw a hippo! I love this story, you made me hooked for the first 3-sec! Now I understand why luxury safari is way better, no matter how much you want to get it on a budget. Safety is important that saving few extras. However, the memories and experiences you’ve got are priceless! Oh my God ! I was freaked out reading your story and I guess in hindsight you can call it an adventure but I can only imagine how fast your hearts must be beating at that moment. I’d love to stay in a Banda myself but definitely would not want to venture out all alone at night, when its the lions’ feasting time. Thank heavens you people got out safe. Haha you’re absolutely right. It was an adventure indeed, but only in hindsight. It was a scary experience, but certainly a memorable one. I doubt that I would have remembered if we just stayed in another fancy lodge. Those all become the same after awhile. 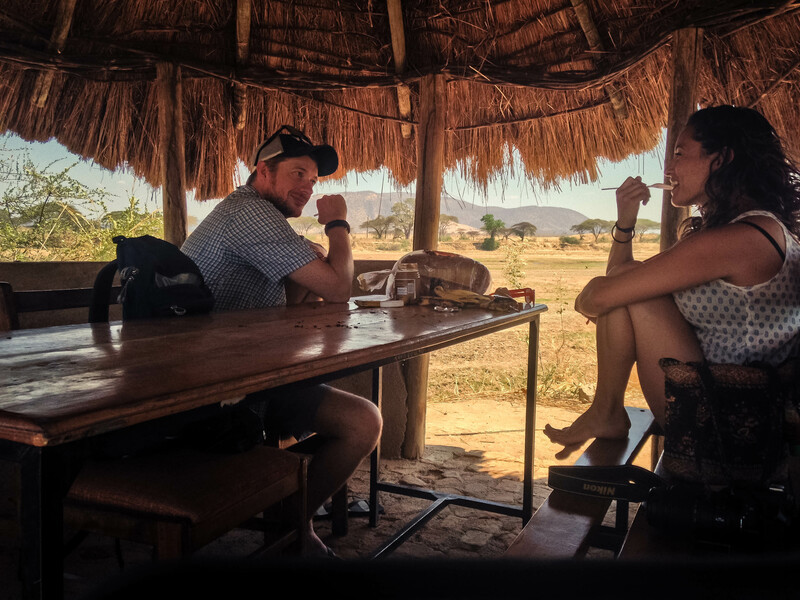 On the other hand, staying in a tin thatched roofed banda and then running out into lion infested darkness…we won’t forget that story for a lifetime! That is a bit creepy and scary …those noises and to know that there might be something lurking there. The accomodation turned out to be quite an adventure. I guess I would have stuck to the Banda and stayed in rather than run out . However, no saying what might have actually happened.